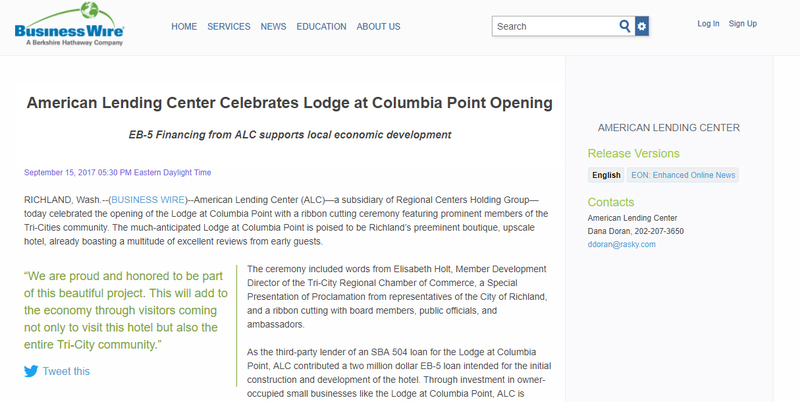 American Lending Center (ALC)—a subsidiary of Regional Centers Holding Group—today celebrated the opening of the Lodge at Columbia Point with a ribbon cutting ceremony featuring prominent members of the Tri-Cities community. The much-anticipated Lodge at Columbia Point is poised to be Richland’s preeminent boutique, upscale hotel, already boasting a multitude of excellent reviews from early guests. The ceremony included words from Elisabeth Holt, Member Development Director of the Tri-City Regional Chamber of Commerce, a Special Presentation of Proclamation from representatives of the City of Richland, and a ribbon cutting with board members, public officials, and ambassadors.